In time, Adams put these recollections on tape for Billy Graham. Deeply touched, he then suggested putting them into book form, knowing so many would draw comfort and strength from seeing how one younger woman learned so much from an older one. Treasured Moments with Mother Grahamis the sparkling result, four months worth of daily devotions built from the diary of Rose Adams. 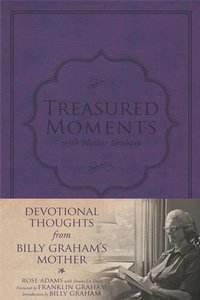 Each entry includes a word of Truth from Mother Graham, a related Scripture and application, a recollection from Rose Adams to Billy Graham on the context and meaning of this teaching from his mother, and finally is complemented by reflections on this thought from Billy Graham. These are indeed treasured moments that span every book of the Bible and every facet of the Christian life. About "Treasured Moments With Mother Graham"
Rose Adams served as a caregiver for Billy Graham's mother, Morrow Coffey Graham, who died in 1981. Now in her eighties, she serves as a volunteer host in Mother Graham's home that is open to the public and located on the Billy Graham Library property in Charlotte, North Carolina. An American icon and the greatest religious leader of our time; hailed as the world's preacher, Billy Graham's career has spanned more than five decades and his ministry of faith has touched the hearts and souls of millions. He has preached the Gospel to more people in a live-audience format than anyone else in history - more than 210 million people, in more than 185 countries and territories through various meetings, including Mission World and Global Mission. Today Billy Graham and his ministry are known around the globe. He has preached in remote African villages and in the heart of New York City, and those to whom he has ministered have ranged from heads of state to the simple living bushmen of Australia and the wandering tribes of Africa and the Middle East. Since 1977, Dr. Graham has been accorded the opportunity to conduct preaching missions in virtually every country of the former Eastern bloc, including the former Soviet Union. Born William Franklin Graham, Jr., in Charlotte, North Carolina, in 1918, he entered the ministry in 1943 and soon began conducting evangelistic crusades. In 1950, he founded The Billy Graham Evangelistic Association, which has sponsored crusades and produced radio and television programs as well as films.